"Crisps" redirects here. For other uses, see Crisp (disambiguation). For the thicker batons of potato sometimes known as "chips", see French fries. 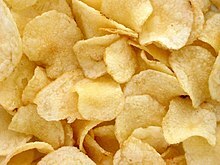 Potato chips (often just chips), or crisps, are thin slices of potato that have been deep fried or baked until crunchy. They are commonly served as a snack, side dish, or appetizer. The basic chips are cooked and salted; additional varieties are manufactured using various flavorings and ingredients including herbs, spices, cheeses, other natural flavors, artificial flavors, and additives. Potato chips are a predominant part of the snack food and convenience food market in Western countries. The global potato chip market generated total revenue of US$16.49 billion in 2005. This accounted for 35.5% of the total savory snacks market in that year ($46.1 billion). The earliest known recipe for something similar to today's potato chips is in the English cook William Kitchiner's book The Cook's Oracle, first published in 1817, which was a bestseller in the United Kingdom. The 1822 edition's version of recipe 104 is called "Potatoes fried in Slices or Shavings" and reads "peel large potatoes, slice them about a quarter of an inch thick, or cut them in shavings round and round, as you would peel a lemon; dry them well in a clean cloth, and fry them in lard or dripping". Early recipes for potato chips in the United States are found in Mary Randolph's Virginia House-Wife (1824), and in N.K.M. Lee's Cook's Own Book (1832), both of which explicitly cite Kitchiner. However, a legend associates the creation of potato chips with Saratoga Springs, New York, decades later. By the late nineteenth century, a popular version of the story attributed the dish to George Crum, an American cook of African American and Native American heritage at Moon's Lake House, who was trying to appease an unhappy customer on 24 August 1853. The customer kept sending his French-fried potatoes back, complaining that they were too thick, too "soggy," and/or not salted well enough. Frustrated, Crum personally sliced several potatoes extremely thin, fried the potato slices to a crisp, and seasoned them with extra salt. To Crum's surprise, the customer loved them. They soon came to be called "Saratoga Chips," a name that persisted into at least the mid-twentieth century. A version of this story popularized in a 1973 national advertising campaign by St. Regis Paper Company, which manufactured packaging for chips, said that Crum's customer was Cornelius Vanderbilt. Crum was already renowned as a chef at the time, and by 1860, he owned his own lakeside restaurant, which he called Crum's House. In the 20th century, potato chips spread beyond chef-cooked restaurant fare and began to be mass-produced for home consumption. The Dayton, Ohio-based Mike-sell's Potato Chip Company, founded in 1910, identifies as the "oldest potato chip company in the United States". New England-based Tri-Sum Potato Chips, founded in 1908 as the Leominster Potato Chip Company, in Leominster, Massachusetts claim to be America's first potato chip manufacturer. In an idea originated by the Smiths Potato Crisps Company Ltd, formed in 1920, Frank Smith packaged a twist of salt with his chips in greaseproof paper bags, which were sold around London. The potato chip remained otherwise unseasoned until an innovation by Joe "Spud" Murphy, the owner of the Irish crisps company Tayto, who in the 1950s developed a technology to add seasoning during manufacture. After some trial and error, Murphy and his employee Seamus Burke produced the world's first seasoned chips: Cheese & Onion and Salt & Vinegar. Companies worldwide sought to buy the rights to Tayto's technique. The first flavored chips in the United States, barbecue flavor, were being manufactured and sold by 1954. In 1958, Herr's was the first company to introduce barbecue-flavored potato chips in Pennsylvania. Chips sold in markets were usually sold in tins or scooped out of storefront glass bins and delivered by horse and wagon. Early potato chip bags were wax paper with the ends ironed or stapled together. At first, potato chips were packaged in barrels or tins, which left chips at the bottom stale and crumbled. In the 1920s, Laura Scudder, an entrepreneur in Monterey Park, California, started having her workers take home sheets of wax paper to iron into the form of bags, which were filled with chips at her factory the next day. This pioneering method reduced crumbling and kept the chips fresh and crisp longer. This innovation, along with the invention of cellophane, allowed potato chips to become a mass-market product. Today, chips are packaged in plastic bags, with nitrogen gas blown in prior to sealing to lengthen shelf life, and provide protection against crushing. Chips were long made in a batch process, where the potato slices are rinsed with cold water to release starch, fried at a low temperature (300 °F (150 °C)), and continuously raked to prevent them from sticking together. Industrial advances resulted in a shift to production by a continuous process, running chips through a vat of hot oil and drying them in a conveyor process. Some small producers continued to use a batch process, notably in Maui. In 1980, inspired by the Maui Chip, an entrepreneur started Cape Cod Potato Chips to produce thicker, batch-cooked "Hawaiian style" potato chips, which came to be known as kettle-style (US) or hand-cooked (UK) chips and became a premium, "gourmet" item. Kettle chips are thicker and the surface starch is not rinsed off, resulting in a style of chip called "hard bite". Little consistency exists in the English-speaking world for names of fried potato slices, thick or thin. American and Canadian English use "chips" for the above-mentioned dish — this term is also used (but not universally) in other parts of world, and sometimes "crisps" for the same made from batter. In the United Kingdom and Ireland, "crisps" are potato chips which are eaten at room temperature, whilst "chips" are similar to french fries (as in "fish and chips") and are served hot. In Australia, some parts of South Africa, New Zealand, India, the general West Indies especially in Barbados, both forms of potato product are simply known as "chips", as are the larger "home-style" potato crisps. In the north of New Zealand, they are known as "chippies", but are marketed as "chips" throughout the country. In Australia and New Zealand, sometimes the distinction is made between "hot chips" (fried potatoes) and "chips" or "potato chips". 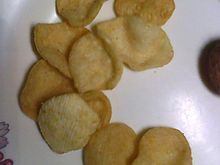 In Bangladesh, they are generally known as "chip" or "chips", and much less frequently as "crisps" (pronounced "kirisp") and locally, alu bhaja (for their similarity to the native potato bhajji). In German-speaking countries (Austria, Germany: "Kartoffelchips"; Switzerland: "Pommes Chips") and in countries of the former SFR Yugoslavia, fried thin potato slices are known as "chips" (locally pronounced very similar to the actual English pronunciation), with a clear distinction from french fries. In Brazil, "home-style" potato chips are known as batatas portuguesas ("Portuguese potatoes") if their sides are relatively smooth and batatas prussianas ("Prussian potatoes") if their sides show a wafer biscuit-like pattern, whilst American-like industrial uniform potato chips made from a fried potato purée-based dough are known as "batata chips" ("potato chips"), or just "chips". Most potato chips contain high levels of sodium, from salt. This has been linked to health issues such as high blood pressure. However, researchers at Queen Mary University of London in 2004 have noted that a small "bag of ready-salted crisps" contains less salt than a serving of many breakfast cereals, including "every brand of cornflakes on sale in the UK." Some potato chip companies have responded to the long-standing concerns by investing in research and development to modify existing recipes and create health-conscious products. PepsiCo research shows that about 80% of salt on chips is not sensed by the tongue before being swallowed. Frito-Lay spent $414 million in 2009 on product development, including development of salt crystals that would reduce the salt content of Lay's potato chips without adversely affecting flavor. Unsalted chips are available, e.g. the longstanding British brand Salt 'n' Shake, whose chips are not seasoned, but instead include a small salt sachet in the bag for seasoning to taste. Many other popular brands in the United States, such as Frito-Lay, also offer such a product. Salt and vinegar is a favorite variety of crisp in the United Kingdom. In Canada, seasonings include dill pickle, jalapeño, ketchup, barbecue, all dressed, sour cream and onion, and salt and vinegar. In 2006, Lay's introduced wasabi chips in Toronto and Vancouver, but no longer offers them. Loblaw, Canada's largest food retailer, offers several unusual flavors under its President's Choice brand, including poutine, maple bacon, Jamaican jerk chicken, Greek feta and olive, ballpark hot dog, and barbeque baby back ribs. In Hong Kong, the two prominent potato chips are the spicy "Ethnican" variety by Calbee, and barbecue by Jack 'n Jill. Lay's are also popular in Hong Kong. In Indonesia, potato chips are commonly called as kripik kentang, traditionally fell under kripik category. Indonesian potato chips market is mainly ruled by two brands; Indofood's Chitato (since 1990s) and Lay's (an Indofood and Frito-Lay joint venture). In 2014, Japanese Calbee and Indonesian Wing's food formed Calbeewings, a joint venture and marketed Potabee potato chips in Indonesia. Common potato chips flavors marketed in Indonesia include beef barbecue, spicy chicken, cheese and plain salted. Lay's potato chips sold in Indonesia is available in 6 flavors; honey butter, sour cream and onion, nori seaweed, beef barbecue, classic salty, and salmon teriyaki flavors. Potabee sold in Indonesia offers two flavors; beef BBQ and grilled seaweed. In 2018 Chitato launched "Do Us A Flavor" campaign that sell three unusual flavors; beef rendang, fried crab golden egg yolk, and mango sticky rice. In Ireland, the two most popular flavors are cheese and onion, and salt and vinegar. However in Ireland, the word "Tayto" is synonymous with potato chips after the Tayto brand and can be used to describe all varieties of chips, including those not produced by Tayto. Hunky Dorys and King crisps are other popular Irish brands. In November 2010, the Tayto company opened a theme park called "Tayto Park". In Colombia, lemon, chicken, chorizo, and sirloin steak with mushroom sauce flavored potato chips are sold. In Japan, flavors include norishio (nori and salt), consommé, wasabi, soy sauce and butter, garlic, plum, barbecue, pizza, mayonnaise, and black pepper. Chili, scallop with butter, teriyaki, takoyaki, and yakitori chip flavors are also available. Major manufacturers are Calbee, Koikeya and Yamayoshi. More exotic flavors are Thai sweet chili, roast pork and creamy mustard sauce, lime and Thai spices, chicken with Italian herbs, sea salt and cracked black pepper, sea salt and chardonnay wine vinegar, sea salt and cider vinegar, spicy and aromatic curry, turkey and bacon, caramelized onion and sweet balsamic vinegar, Stilton and cranberry, mango chili, and special flavors, such as American cheeseburger and English roast beef and Yorkshire pudding. [non-primary source needed] Kettle Foods Ltd's range of thick-cut crunchy potato crisps such flavors as Mexican limes with a hint of chilli, salsa with mesquite, buffalo mozzarella tomato and basil, mature cheddar with Adnams Broadside Beer, Soulmate cheeses, and onion. McCoys Crisps are also popular in the UK. In the north of England, Seabrook Potato Crisps are popular, but they are much less common in the south. Tayto is a popular brand in Northern Ireland. In the United States, popular potato chip flavorings include sour cream and onion, salt and vinegar, and barbecue. In the Gulf South, Zapp's Potato Chips of Gramercy, Louisiana, manufactures kettle-fried chips with regional flavors such as Crawtator, Cajun dill, Voodoo, and Creole onion. Pennsylvania leads the United States in potato-chip production, and it has been dubbed "the Potato Chip Capital" by several sources. Pennsylvania-based companies that produce potato chips include Utz Quality Foods, Herr's Snacks, Snyder's of Hanover, Martin's Potato Chips, Wise Foods, Middleswarth Potato Chips, Dieffenbach's Potato Chips, Hartley's Potato Chips, Gibbles Foods, Stehman's Potato Chips, and Charles Chips. These are all member companies of "The Snack Food Association of the United States." Pringles potato crisps are uniform in size and shape, which allows them to be stacked. Another type of potato chip, notably the Pringles and Lay's Stax brands, is made by extruding or pressing a dough made from dehydrated potatoes into the desired shape before frying. This makes chips that are uniform in size and shape, which allows them to be stacked and packaged in rigid cardboard or plastic canisters. Pringles are officially branded as potato crisps, but they are rarely referred to as such by Americans. Conversely, Pringles may be termed potato chips in Britain, to distinguish them from traditional "crisps". Munchos, another brand that uses the term potato crisps, has deep air pockets in its chips that give it a curved shape, though the chips themselves resemble regular bagged chips. An additional variant of potato chips exists in the form of "potato sticks", also called shoestring potatoes. These are made as extremely thin (2 to 3 mm) versions of the popular French fry but are fried in the manner of regular salted potato chips. A hickory-smoke-flavored version is popular in Canada, going by the vending machine name "Hickory Sticks". Potato sticks are typically packaged in rigid containers, although some manufacturers use flexible pouches, similar to potato chip bags. Potato sticks were originally packed in hermetically sealed steel cans. In the 1960s, manufacturers switched to the less expensive composite canister (similar to the Pringles container). Reckitt Benckiser was a market leader in this category under the Durkee Potato Stix and French's Potato Sticks names but exited the business in 2008. In 2014, French's reentered the market. A larger variant (about 1 cm thick) made with dehydrated potatoes is marketed as Andy Capp's Pub Fries, using the theme of a long-running British comic strip, which are baked and sold in a variety of flavors. Walkers make a similar product (using the Smiths brand) called "Chipsticks" which are sold in ready-salted and salt and vinegar flavors. Some companies have also marketed baked potato chips as an alternative with lower fat content. Additionally, some varieties of fat-free chips have been made using artificial, and indigestible, fat substitutes. These became well known in the media when an ingredient many contained, Olestra, was linked in some individuals to abdominal discomfort and loose stools. Flavored corn chips such as Fritos are an outgrowth of traditional fried tortilla chips. Americans' appetite for crispy snacks gave birth to the packaged, flavored corn chips, with such brands as Fritos, CC's, and Doritos dominating the market. "Swamp chips" are similarly made from a variety of root vegetables, such as parsnips, rutabagas, and carrots. Japanese-style variants include extruded chips, like products made from rice or cassava. In South Indian snack cuisine, an item called happla in Kannada/vadam in Tamil, is a chip made of an extruded rice-sago or multigrain base that has been around for many centuries. Many other products might be called "crisps" in Britain, but would not be classed as "potato chips" because they are not made with potato or are not chipped (for example, Wotsits, Quavers, Skips, Hula Hoops, and Monster Munch). Kumara (sweet potato) chips are eaten in Korea, New Zealand, and Japan; parsnip, beetroot, and carrot crisps are available in the United Kingdom. India is famous for a large number of localized 'chips shops', selling not only potato chips, but also other varieties such as plantain chips, tapioca chips, yam chips, and even carrot chips. Plantain chips, also known as chifles or tostones, are also sold in the Western Hemisphere from Canada to Chile. In the Philippines, banana chips can be found sold at local stores. In Kenya, chips are made from arrowroot and casava. In the United Kingdom, Sweden, Finland, and Australia, a new variety of Pringles made from rice has been released and marketed as lower in fat than its potato counterparts. ^ "PotatoPro/Datamonitor". Potatopro.com. Archived from the original on 15 July 2011. Retrieved 26 May 2009. ^ Berry, Steve & Norman, Phil (14 July 2014). "'Crisps buoyed Britain in its darkest hour'". The Telegraph. Archived from the original on 3 October 2014. Retrieved 26 August 2014. ^ McWilliams, Mark (2012). The Story Behind the Dish: Classic American Foods. ABC-CLIO. p. 186. ISBN 9780313385100. Archived from the original on 22 February 2014. ^ Smith, Merril D. (2013). History of American Cooking. ABC-CLIO. p. 93. ISBN 9780313387111. Archived from the original on 15 April 2016. ^ a b c Fox, William S. & Banner, Mae G. (April 1983). "Social and Economic Contexts of Folklore Variants: The Case of Potato Chip Legends". Western Folklore. 42 (2): 114–126. JSTOR 1499968. ^ Upton, Kim (3 July 2003). "Any Way You Slice It, Potato Chip's Going Strong After 150 Years". Fort Lauderdale Sun Sentinel. Archived from the original on 25 December 2014. ^ Henley, Jon (1 September 2010). "Crisps: a very British habit | Life and style". The Guardian. Archived from the original on 25 July 2014. Retrieved 26 August 2014. ^ "George Crum: Inventor of Potato Chips". Black-inventor.com. Archived from the original on 6 January 2014. Retrieved 13 January 2014. ^ McNulty, Mary F. "How potato chip is made - used, processing, product, machine, Raw Materials, The Manufacturing Process, Quality Control, Byproducts/Waste, The Future". Madehow.com. Archived from the original on 7 July 2010. Retrieved 3 August 2010. ^ "Civil War Recipes and Food History - The Potato During the Civil War". Civilwarinteractive.com. Archived from the original on 22 October 2014. Retrieved 11 May 2013. ^ "About Us". Mike-sell's. Archived from the original on 25 June 2009. Retrieved 26 May 2009. ^ Katz, Marc (16 May 2010). "Mike-Sell's celebrating 100 years of potato chips; The company could be the oldest continuous potato chip operation in world". Dayton Daily News. Archived from the original on 3 November 2013. ^ Cogliano, Joe (14 May 2012). "Mike-sell's names new CEO". Dayton Business Journal. Archived from the original on 24 December 2014. ^ Harmon, John E. "Potato Chips". Atlas of Popular Culture in the Northeastern US. Archived from the original on 20 February 2011. Retrieved 31 December 2014. ^ Radvon, Erik (17 October 2008). "Tri-Sum Chips celebrates 100 years: Leominster staple is oldest surviving potato chip in America". Leominster Champion. Archived from the original on 25 December 2014. ^ "BBC h2g2 Potato Crisps - A History". BBC. 7 December 2006. Archived from the original on 17 August 2009. Retrieved 26 May 2009. ^ "Joe 'Spud' Murphy: The Man Who Gave Potato Chips Flavor". Huffington Post. 20 April 2012. Archived from the original on 31 October 2014. ^ Hochman, Karen. "A History of the Potato Chip: Page 4: The First Salted & Flavored Potato Chips". The Nibble. Archived from the original on 22 December 2015. ^ Pease, Sue (5 August 2002). "Lays flavor is chip off the Memphis barbecue block". Memphis Daily News. Archived from the original on 25 January 2015. ^ Atwood, Liz (2 July 2003). "Palate-pleasing Chips: Snack Phenomenon Comes In All Flavors, Shapes And Colors". Newport News Daily Press. Archived from the original on 23 January 2015. ^ Martin, Chuck (18 June 2003). "Ohio cashes in on chips". Cincinnati Enquirer. ^ Weaver, Kyle R. (Summer 2012). "Snackin' - Pennsylvania Style!". Pennsylvania Heritage Magazine. XXXIII (3). Archived from the original on 22 August 2015. ^ "Our History". Laura Scudder's. 17 September 2008. Archived from the original on 17 September 2008. Retrieved 11 May 2013. ^ Hudson, Berkley (9 April 1989). "Laura Scudder Was More Than a Name: Monterey Park Will Honor 'Pioneer, Instigator, Doer' Who Helped Create Snack-Food Industry". Los Angeles Times. Archived from the original on 6 November 2013. ^ La Ganga, Maria L. (23 September 1987). "Laura Scudder Owed a Lot to Peanut Butter". Los Angeles Times. Archived from the original on 28 September 2015. ^ "The History and Origin of Potato Chips". Students.cup.edu. Archived from the original on 27 January 2010. Retrieved 3 August 2010. ^ Singh, Maanvi (24 July 2014). "The Weird, Underappreciated World Of Plastic Packaging". NPR. Archived from the original on 28 July 2014. Retrieved 29 July 2014. ^ Serious Eats. "The Food Lab: Extra-Crunchy Homemade Potato Chips". seriouseats.com. Archived from the original on 28 March 2017. Retrieved 1 May 2017. ^ Roman, Alison (October 2014). "Crispiest Potato Chip". Bon Appétit. Archived from the original on 5 May 2017. Retrieved 1 May 2017. ^ "Chips or fries or crisps?". Oxford Dictionaries. Retrieved 11 January 2019. ^ Rothstein, William G. (2003). Public Health and the Risk Factor: A History of an Uneven Medical Revolution. Boydell & Brewer. ISBN 9781580461276. ^ "Health hazard hidden in breakfast bowls". Action on Salt. Queen Mary University of London. 12 November 2004. Archived from the original on 7 November 2012. ^ McKay, Betsy (22 March 2010). "PepsiCo Develops 'Designer Salt' to Chip Away at Sodium Intake". Wall Street Journal. Archived from the original on 23 December 2014. Retrieved 22 March 2010. ^ a b "Martin Short partners with the Lay's® brand and invites Canadians to create the brand's next big flavour" (Press release). PepsiCo Canada. 4 February 2013. Archived from the original on 22 January 2015. ^ Weisblott, Marc (3 June 2013). "The mystery of the history of ketchup chips in Canada". Postmedia News. Archived from the original on 22 January 2015. ^ Hoffman, Andy (21 February 2006). "Frito Lay perks up chips". The Globe and Mail. Archived from the original on 4 March 2016. ^ "Lay's Canadian website". Archived from the original on 31 October 2012. Retrieved 21 October 2012. ^ "PC World of Flavours Maple Bacon Potato Chips". Maxi (Canadian supermarket). Archived from the original on 14 July 2015. ^ "Calbee Four Seas Co. Ltd". Archived from the original on 24 August 2008. Retrieved 24 August 2008. ^ ronnzemo. "Yuk Kita Lihat Sejarah dan Perubahan Chitato Dari Dulu Hingga Sekarang". KASKUS (in Indonesian). Retrieved 27 February 2018. ^ "Lays". www.indofood.com. Retrieved 27 February 2018. ^ "Calbeewings". calbeewings.co.id. Retrieved 27 February 2018. ^ Makmur, PT Indofood Sukses. "Chitato Do Us A Flavor". chitatodousaflavor.com. Retrieved 27 February 2018. ^ O'Connell, Brian (6 June 2009). "Two packets of Tayto and a bottle of TK ..." The Irish Times. ^ "Tayto Park - Theme Park & Zoo". www.taytopark.ie. Retrieved 22 March 2019. ^ "Super Ricas Productos". Super Ricas. Archived from the original on 23 June 2015. Retrieved 15 June 2015. ^ "Calbee カルビー株式会社". Calbee. Archived from the original on 4 June 2009. Retrieved 26 May 2009. ^ "株式会社湖池屋｜総合スナックメーカーのコイケヤ". Koikeya.co.jp. Archived from the original on 21 April 2009. Retrieved 26 May 2009. ^ Briggs, Hannah (30 May 2013). "BBC Food: Crisps: Is classic potato losing its appeal?". BBC. Archived from the original on 23 February 2015. Retrieved 13 March 2015. ^ "Walkers Flavour Cup". Archived from the original on 29 October 2010. Retrieved 15 October 2010. ^ "LAY'S". Frito-Lay. Archived from the original on 29 May 2010. Retrieved 3 August 2010. ^ "Zapp's Potato Chips". Zapps.com. Archived from the original on 2 January 2014. Retrieved 13 January 2014. ^ Wohlsen, Marcus (4 July 2013). "The Secret Behind the Success of the Country's Potato Chip Capital". Wired. Archived from the original on 6 January 2017. Retrieved 29 January 2017. ^ "Middleswarth Potato Chips". Archived from the original on 9 January 2017. Retrieved 29 January 2017. ^ "Dieffenbachs Potato Chips - Experience the Delicious Difference!". Archived from the original on 3 February 2017. Retrieved 29 January 2017. ^ "Hartleys Potato Chips". Archived from the original on 7 February 2017. Retrieved 29 January 2017. ^ "New Fat-free Product on the Market". National Institute of Diabetes and Digestive and Kidney Diseases. Summer 1998. Archived from the original on 10 February 2009. Retrieved 26 May 2009. ^ Olson, Elizabeth (1 July 2010). "Pringles Introduces a Multigrain Variety". The New York Times. ISSN 0362-4331. Retrieved 24 January 2019. Banham, Rayner (1977) "The Crisp at the Crossroads", in P. Barker (ed) Arts in Society. London: Fontana. Jones, Charlotte Foltz (1991). Mistakes That Worked. Doubleday. ISBN 978-0-385-26246-0. – Origins of potato chips. Burhans, Dirk E. (2008). Crunch! : a history of the great American potato chip. University of Wisconsin Press. ISBN 9780299227708. Look up potato chip in Wiktionary, the free dictionary.